Hello again to our storage container and goodbye (for now) to the faithful bicycle that carried me for so many miles this summer in Iowa. 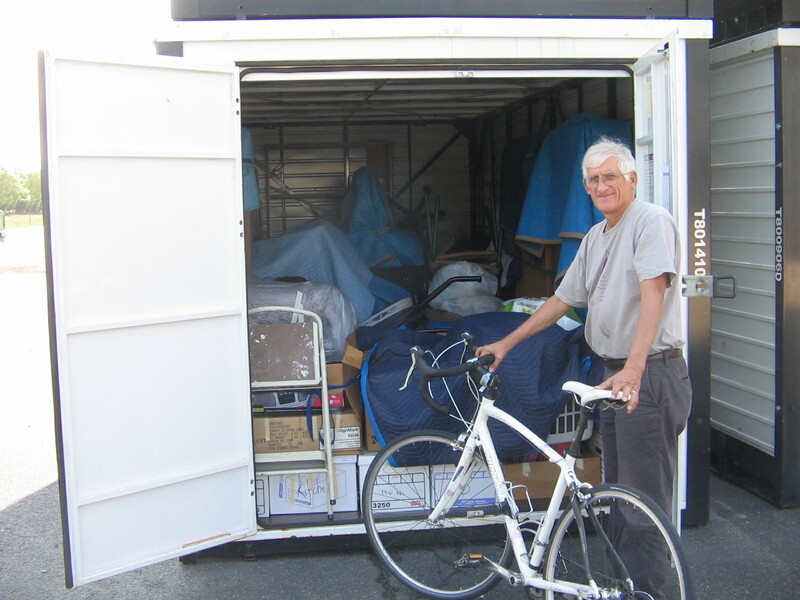 One of the tasks we accomplished in our 5-day day stopover in Virginia was to gain access to our storage container so that we could offload one of 3 bicycles we have been carrying on the back of the car ever since we left Iowa. It was a strange feeling to look inside the container and see the household goods we had put there way back in December. One file cabinet drawer had come loose, but, other than that, everything was just as we had left it. And when we resettle somewhere and call for the container to be delivered I expect that we will find everything just as we left it. Closing the door and saying goodbye to “stuff” is not a big deal. It was much more difficult to say hello and goodbye to the many friends that we reconnected with this week. When you are wandering around the country it’s easy to get distracted and not pay as much attention as you should to keeping in touch with friends. With a limited number of days here we didn’t see everyone, but we were blessed tremendously by each and every one of the friends we did see. We are especially grateful to Brian and Darlene for having us over for a cookout, to Greg and Wayne for keeping our mail for us, to Eva for letting us crash at her place and to Matt and Veronica for putting us up at their beautiful country home in Culpeper. And then our friends at church and Liz and Alex and the group at their home were so welcoming and made us feel that we hadn’t left here at all. But now there are other places yet to visit and it’s time to say goodbye once again to Virginia. Tomorrow’s travels will take us to West Virginia where we will see our 2 grandsons and check out the family’s new digs in Marlinton. The storage bin makes me think of a program I get a kick out of..Storage Wars. Also I agree with your assessment of how unimportant “stuff” is compared with reconnecting with old friends. You certainly have benefitted in so many ways from your adventure. Congratulations.